Saturday, March 31, 9 a.m. - 5 p.m. and Sunday, April 1, 9 a.m. - 4 p.m.
Spiky, spiny, succulent, round, columnar, thorny, prickly, smooth, glaucous, gray, silvery—now crown these adjectives with shimmering, miracle flowers in scarlet, orange, magenta, yellow (any color but blue—that’s a no no) and you have the upcoming Colorado Cactus and Succulent Sale in a nutshell! Google “Millennial” and “Succulent” as I just did, and you will find a slew of articles, blogs, posts of all sorts buzzing about the subject. 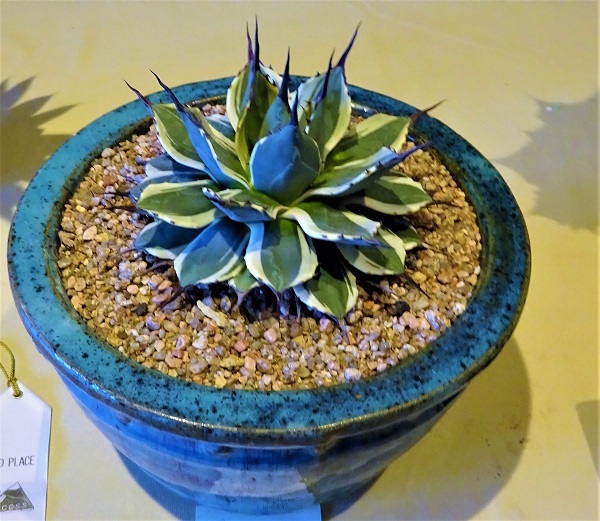 Better yet, come to the sale and watch the aisles of Mitchell Hall jam-packed with young people gasping, giggling and scarfing up succulents studded with even more spikes than THEY are adorned with! Everyone has a bit of space on their window sill for just another pot or two of succulents, and maybe it’s time to splurge on a little greenhouse? And there’s always the great out-of-doors! When the next four year, disastrous acute drought begins in 2021, those of us clever enough to have turned boring lawns into gorgeous xeriscapes full of succulents will be giggling as your bluegrass turns brown brown brown all summer long! Haha! 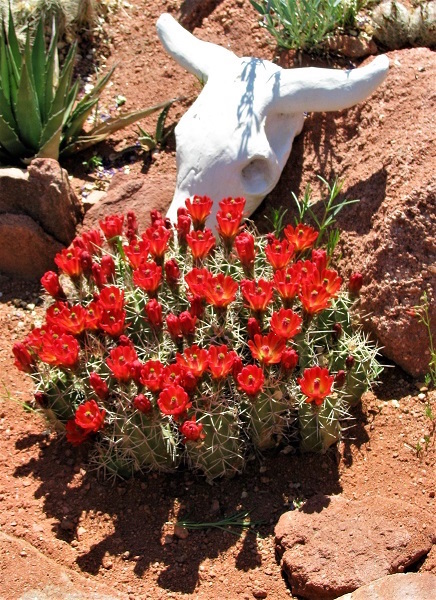 Nurseries from across the region will bring an extraordinary assortment of tender and hardy cacti and succulents. Cactusdata from Edgewood owned by Woody Minnich (arguably America’s greatest cactus guru) is always here with treasures from all hemispheres—all with accurate data on their seeds of origin. Kelly Grummons, our home-grown guru of hardy cactus, will have tables groaning with the choice Opuntia hybrids he’s developed, many of which re-bloom through the summer. Emerald Leaf—a fantastic wholesale nursery based in Arvada—unveils thousands of treasures in all sizes, for all budgets. And many, many more! There will be potters galore (buy your plant, buy your pot and members of the club will pot them up for free! ), artwork and succulent jewelry. Be sure not to miss the society’s Plant Show, full of wonderful specimens grown to perfection. And there will be talks every hour or so through the day packed with information. Enough to satisfy your winter weary heart and brim your parched cactophilia to overflowing! There will be more cash registers and cashiers than ever on hand to expedite things—it is a festive occasion! Members of the Gardens of course can come for free, but everyone is welcome. Your entry fee to the Gardens lets you in the sale as well. 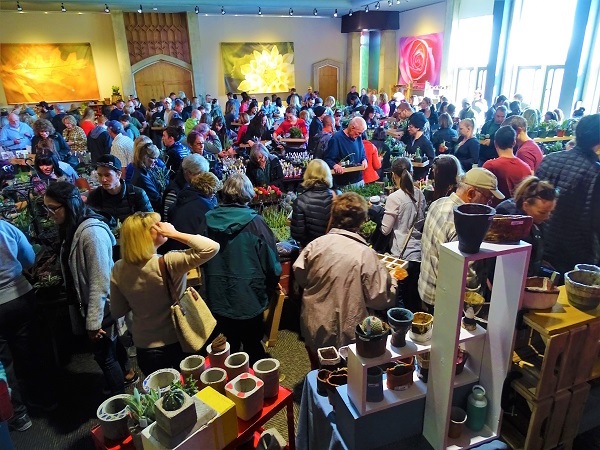 Don’t forget, there’s a Plant Valet where you can park your purchases, and then go stroll the Gardens in their early spring glory for an hour or two before you pick up your treasures and leave. Sounds like a day to me…see you there!